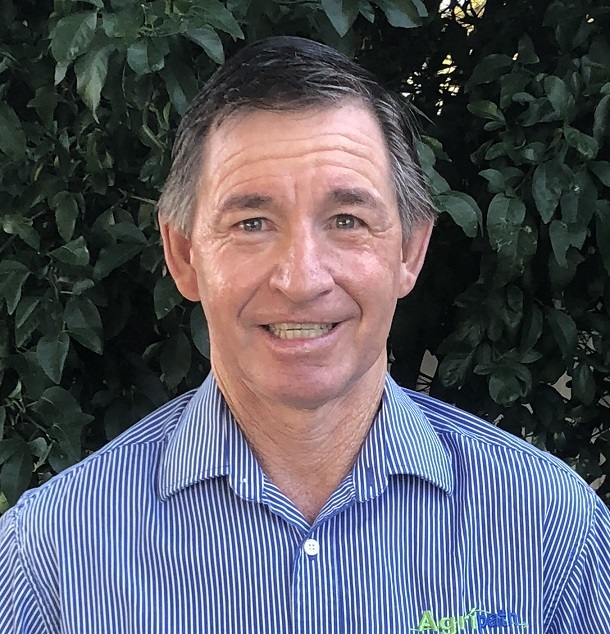 THE top 20 per cent of farming businesses achieve profits and high gross margins through astute decision-making that focuses on good crop yields, crop selection and lower costs, according to Agripath senior consultant in southern Queensland, Kim Bowman. 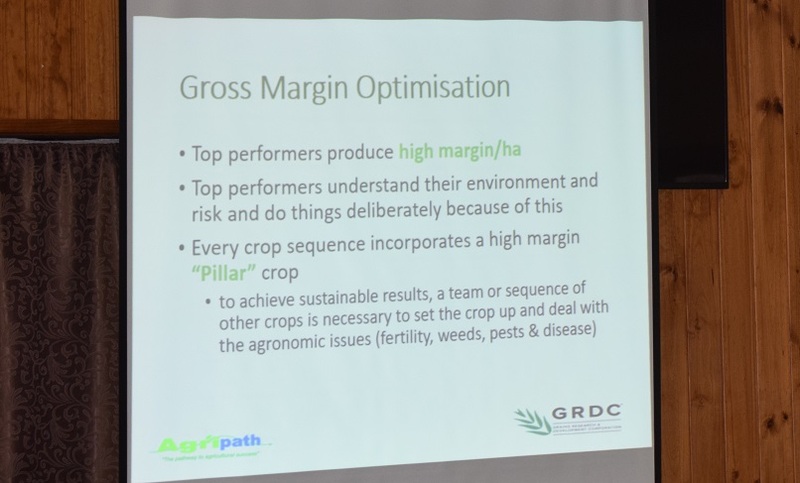 Addressing farming workshops with fellow consultant, Simon Fritsch, Mr Bowman said Agripath had been part of a three-year, Grains Research and Development Corporation-funded (GRDC) national project that analysed the performance of 300 farms Australia-wide. He said the study showed the factors which made the top performers stand out from the rest distilled down to a number of key profit drivers. “One was that the top producers were producing 20 per cent of their asset value in income on their farms. That came about through a variety of crop choices, crop sequences and cropping frequency which all contributed to produce the result,” he said. “Some of those farms did that in a very cost-effective manner. We found some farms run a low-cost business. It is one thing to produce income, but another to do it in a cost-effective manner. Running a low-cost business is a combination of factors which then go to produce margin. Mr Bowman said while farms might vary dramatically in scale, value and potential, they could all be analysed in a similar, comparative way. “There could be land that is worth $8000/hectare and land that is worth $2500/ha. We can compare them on a return on capital basis,” he said. Mr Bowman said one of the main attributes of the top producers performing above the average lay with their decision-making processes and attention to detail. “It comes down to the individual. It is their approach to timeliness of the operations, having the appropriate machinery to do the job at the right time, spraying the weeds at the right time, planting at the right time,” he said. Simon Fritsch highlights the profit drivers that put the top producers above the average. Mr Bowman said the study highlighted the strong correlation between higher water use efficiency and higher gross margin returns. “Those who can conserve more moisture in the fallow and have more moisture at their disposal were able to turn that into higher water use efficiency, which then turned into higher return,” he said. “We found that an extra 20 millimetres of moisture stored in the fallow can result in an extra 400 to 500 kilograms of grain (per hectare), depending on whether it is sorghum or wheat. That can result in a 40 to 50 per cent increase in profit. Mr Bowman said one of the constants among the high achievers was their ability to develop a resilient farming program and stick with it. “In each farming environment there will be dry years, hot summers. It is a matter of knowing that and developing a farming system that is suited to your environment,” he said. Mr Bowman said the top performing farmers consistently had less variance and less risk in their systems. “We have noticed the top producers might average 7 per cent return over a five-year period, but their top might have been 12pc and their bottom 3pc. Whereas with other people, they might have averaged 4pc and had a top of 15pc, but they had a bottom of -5pc. So, their system isn’t quite as robust,” he said. Mr Bowman said producers needed to constantly have discussions with their agronomists about their crop choices and frequency, and ensure they kept applying good agronomic practices. 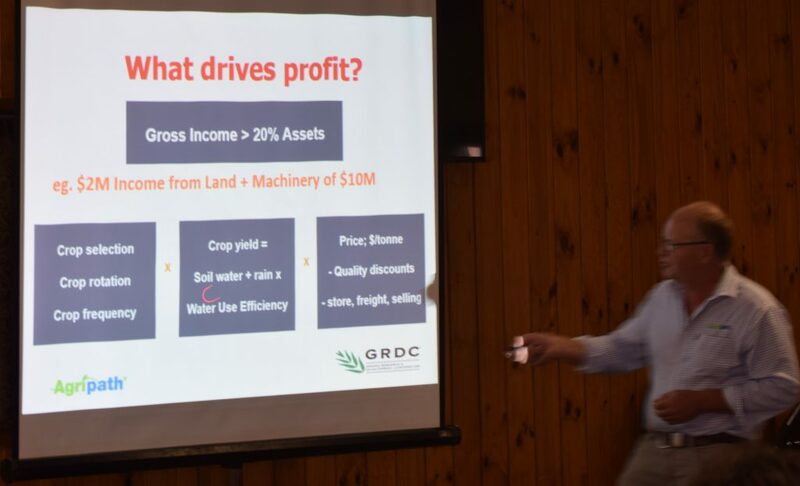 “We noticed in the last couple of years that chickpeas have been a crop with higher dollar return, so some people increased their frequency of chickpea as a percentage of their crop,” he said.